- Our objective is to develop and improve monitoring methods, says Dr. Dominik Lang, Head of the Department Earthquake Hazard and Risk. The project has a time span of two years, and will involve both engineers, seismologists, technical staff and data analysts from NORSAR. The unstable rock slopes within the project are already under surveillance, being monitored by various sensors and technical installations that are partly operated by different institutions. NORSAR's contribution will be to improve the monitoring methods and the automatic processing of signals for early warning. During the project period NORSAR will also be working with data collected by other sensors than just the seismic instruments that are surveilling the unstable rock slopes in a continuous mode. - This way we will be able to analyze earlier events, and also improve methods for analyzing future events in real time, and increase the accuracy of predictions, says Dr. Lang. 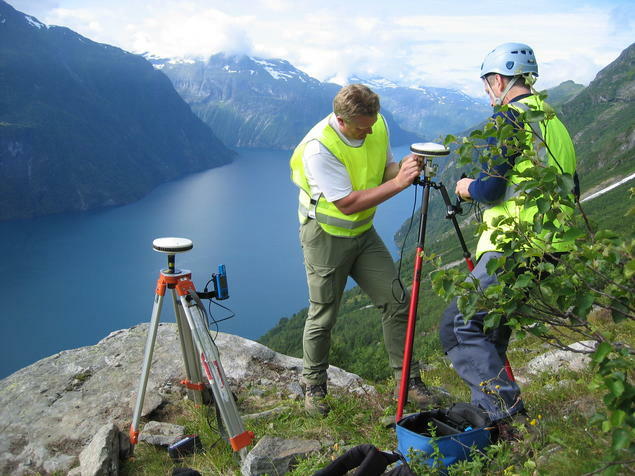 The Norwegian Water Resources and Energy Directorate (NVE) is responsible for the surveillance of the unstable rock slopes, working with a network of specialists from different disciplines. NORSAR has contributed with seismic monitoring and collecting data from the Åknes rock slope since 2009, and from Nordnesfjellet since 2014. For more than 20 years, NORSAR has provided seismological and engineering expertise both domestically and internationally. This involves studies on seismic hazard and risk assessment in almost all parts of the world, with focus areas such as Central America, the Caribbean, Central Asia, Pakistan, and India.